The Scubapro Zoom EVO combo set includes the Scubapro Zoom EVO mask and Scubapro Spectra Snorkel. Designed to fit the needs of prescription-needing dives, the Zoom EVO is a low volume, comfortable mask with tool-free lens replacement. The Semi-dry Scubapro Spectra Snorkel features a guard on the top which stops water splashing into the air tube while you swim at the surface. A watertrap at the bottom of the snorkel helps keep water out of your mouth if a small amount gets in. Tooless Lens Replacement - The Zoom EVO mask allows you to easy swap lenses, perfect for divers with prescription requirements. Tempered Glass- This Scubapro Zoom Evo Mask has hardened glass that will withstand water pressure and many bumps. This is just the reassurance you need when going down between rocks and wrecks. Twin Windows - The twin windows offers a great vision. This allows superb light penetration and gives you a great diving experience. You will not miss a thing with this mask on during a dive. They are specially adapted to be interchangeable. A do-it-yourself job. 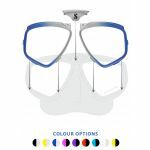 Configurable Frames - Purchase and fit option Zoom Evo colour kits to get the exact look you’re after. 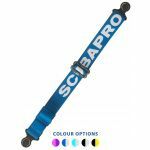 Colours are matched to other Scubapro items. Adjustable Strap - The Scubapro Zoom Evo Mask has adjustable straps that are easy to change whilst under water, even with thick gloves on. The straps make this mask fit to most size faces comfortably. Folding Buckles - As well as easy to use straps this mask buckles collapses down to a low profile so it can easily be stored. Soft Silicone – This masks silicone provides a pliable, comfortable watertight seal. There is a silicon skirt which moulds beautifully to your face for leak free diving. Semi-Dry Design - The Scubapro Spectra uses a semi-dry design. A guard on the top prevents water entering when you’re swimming at the surface so you don't get a mouthful of salty water. Water Trap - A water trap at the bottom of the snorkel captures any liquid that accidentally gets within the snorkel so you can keep breathing easy. Purge Valve - A purge valve is built into the bottom of the snorkel. It efficiently expels any water in the system as you exhale. Large-Bore Upper Tube - The large diameter pipe ensures you can breathe the maximum air possible through the Spectra. Comfortable Mouthpiece - Don’t have your snorkel session spoiled by a painful mouthpiece. The Scubapro Spectra Snorkel has been designed both to allow for a comfortable and secure fit in the mouth to make your dives as painless and easy as possible. Removable Mouthpiece - The mouthpiece is removable so that you can replace it when worn out and for easy cleaning. Quick-Connect Clip - The quick-connect clip means it’s super easy to take the snorkel on or off from your mask when you need it. Who is the Scubapro Zoom EVO Combo set for? This affordable snorkel and mask combo offers an excellent level of performance for beginners or snorkellers on a mid-range budget. Thanks to the tooless, swappable lenses, the mask is ideal for divers of whom require prescription lenses.